Call: Fiona McConnachie on 0266216845/ 0490857481. Email: Fiona McConnachie at gallery@serpentinearts.org. First solo exhibition by Damian Raphael Koch. The show runs from the 15th of February to the 4th of March, 2019. This is the first solo exhibition by Damian Raphael Koch and represents a cross section of his experience of “living the dream” for thirty years in Byron Bay. 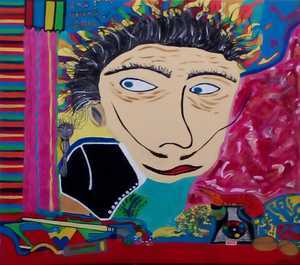 Damian has painted his vision of fun & healing through a collection of bright, Post-Pop acrylic & pastel artworks. Previous exhibitions have included works in “Journeys of Hope” (2017/ 2018) at the Serpentine Gallery, which then traveled to Parliament house, Canberra. Another large format artwork was completed in collaboration with the band “Wolfmother” to raise funds for the Byron Bay Youth Centre in 2014. This work is now for sale with the profits going to a charity in Lismore area. Damian’s art is fresh, bright, colourful, “pop-ish” and young at heart: Damian says his art is for future art lovers. “A Colourful Mind” is open from Friday 15th of February to Tuesday the 4th of march, with the opening at 6.00pm on the 15th. The show is being held at The Serpentine Community Gallery, 17a Bridge Street, North Lismore, 2480. For more information regarding this exhibition please call 66216845 or check out our Facebook page (facebook.com/SerpentineArts).